The “10K Affymetrix array” is a chip that tests for about 11,500 SNPs (single nucleotide polymorphisms, or mutations) in each individual. Personally, I don’t know why more genetic genealogy companies aren’t doing this type of research themselves. The chips are relatively cheap these days, and there are plenty of people willing to send in DNA from all around the world with extensive ancestral information. This is the future of genetic genealogy, and they should be a part of it. “A group of computer scientists, mathematicians, and biologists from around the world have developed a computer algorithm that can help trace the genetic ancestry of thousands of individuals in minutes, without any prior knowledge of their background. The teamâ€™s findings will be published in the September 2007 edition of the journal PLoS Genetics. Unlike previous computer programs of its kind that require prior knowledge of an individualâ€™s ancestry and background, this new algorithm looks for specific DNA markers known as single nucleotide polymorphisms, or SNPs (pronounced snips), and needs nothing more than a DNA sample in the form of a simple cheek swab. 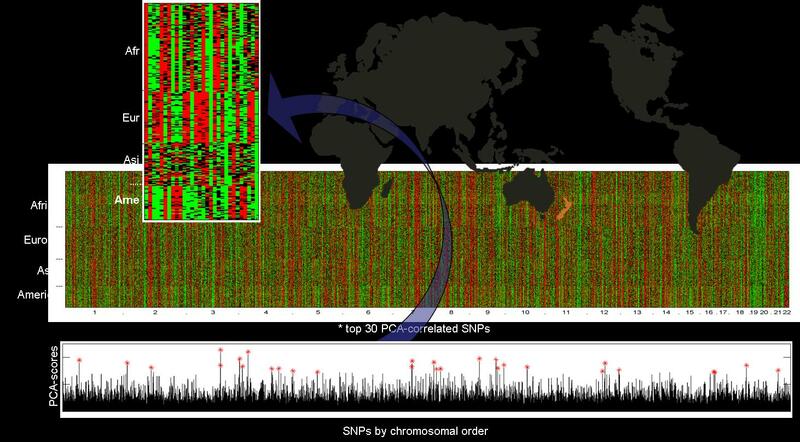 The researchers used genetic data from previous studies to perform and confirm their research, including the new HapMap database, which is working to uncover and map variations in the human genome. Understanding our unique genetic makeup is a crucial step to unraveling the genetic basis for complex diseases, according to the paper. Although the human genome is 99 percent the same from human to human, it is that 1 percent that can have a major impact on our response to diseases, viruses, medications, and toxins. If researchers can uncover the minute genetic details that set each of us apart, biomedical research and treatments can be better customized for each individual, Drineas said. Their program was more than 99 percent accurate and correctly identified the ancestry of hundreds of individuals. This included people from genetically similar populations (such as Chinese and Japanese) and complex genetic populations like Puerto Ricans who can come from a variety of backgrounds including Native American, European, and African. â€œWhen we compared our findings to the existing datasets, only one individual was incorrectly identified and his background was almost equally close between Chinese and Japanese,â€ Drineas said. In addition to Drineas, the algorithm was developed by scientists from California, Puerto Rico, and Greece. The researchers involved include lead author Peristera Paschou from the Democritus University of Thrace in Greece; Elad Ziv, Esteban G. Burchard, and Shweta Choudhry from the University of California, San Francisco; William Rodriguez-Cintron from the University of Puerto Rico School of Medicine in San Juan; and Michael W. Mahoney from Yahoo! Research in California. There’s still a long way to go, but this is a great start. Non-Scientist Summary: A group of researchers used SNP (single nucleotide polymorphism) analysis to identify particular SNPs which are associated with an individual’s particular ancestry (for example, Caucasian, African American, Japanese, etc..). Using this information, they could test individuals with unknown ancestry for those SNPs, in effect characterizing their ancestry based on the SNPs that they possess. I wouldn’t say that genetic genealogy companies aren’t doing this type of research. AncestryByDNA also looks at ethnicity/biogeographical ancestry using SNPS. Some people may say their results are not accurate, but at least the company is continually innovating! Very true, and a good point. As with all new technology, it takes quite a while to filter down to commercial availability. I just wonder if AncestryByDNA is concentrating on too few SNPs – their most advanced test so far only uses about 1,500 SNPs. Perhaps they have more in the works – I’d love to see what’s going on in their R&D department! And besides AncestryByDNA and 23andMe, are there any other Genetic Genealogy companies experimenting with SNP chips or the recent explosion of SNP information? All I can say is bring on the SNPs! I’m waiting on my hi-res Euro-DNA results now, but would love for us all to have as many options for as many SNPs as possible. 10k+?! Sign me up! Yes, this is quite interesting. Since the Microarrays are affordable and a better technology, why not used in the Geneaology to cut short the turnaround time? If I am not wrong Turn around time (average 3-4months)is the major concern for most of the Genealogy customers. Does any one know, any company/lab using Microarray chips for Genetic Genealogy studies. Esp for the YSTR’s and mtDNA studies? I am a keen follower of this technology and haven’t come across the technology trends that most of the companies are using in Genetic Genealogy. Deeps – I think the reason that genetic genealogy companies don’t use microarrays is because it’s not cost effective for so few SNPs. Most of these chips test thousands or millions of SNPs, while genetic genealogy companies only screen a maximum of 67 SNPs. isn’t this just like what DNAtribes.com do? could it be that DNA tribes are using the Petros method? You’re right, DNAtribes.com uses autosomal markers to estimate ancestry, just as was done in this study. However, they test 14 markers by sequencing, rather than using a SNP chip. SNP chips can test thousands of markers. Affordable genome analysis is literally right around the corner (and already here if you can afford services like 23andMe and deCODEme). These type of low-cost tests will examine thousands and thousands of ancestral markers. wouldn’t it better if they added more sequencing for other tribes and nations to the data. it will make the application slower but with better results. I hope they get financed to do that. Absolutely – the more individuals, tribes, ethnicities that get tested and analyzed, the better the comparison.